Chobe National Park is an unspoilt safari playground. Stumble upon wildlife wherever you go in beautiful Botswana. 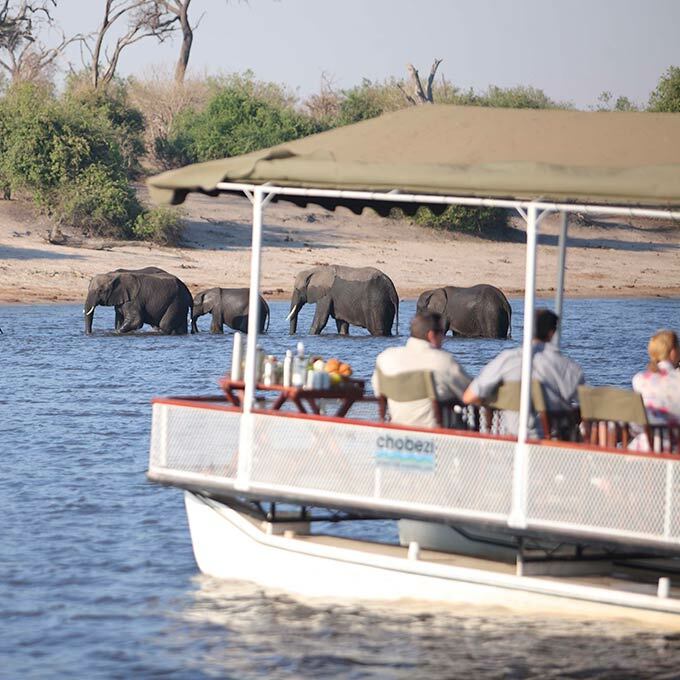 After driving a few metres along the impressive Chobe Riverfront, your guide suddenly stops. An elephant family slowly wanders across the road, planning to take a bath. As you gaze at this amazing scene, you can hear the dull sound of heavy feet in the sand, the breathing and whiffing, and occasional trumpeting from these beautiful, mighty creatures. 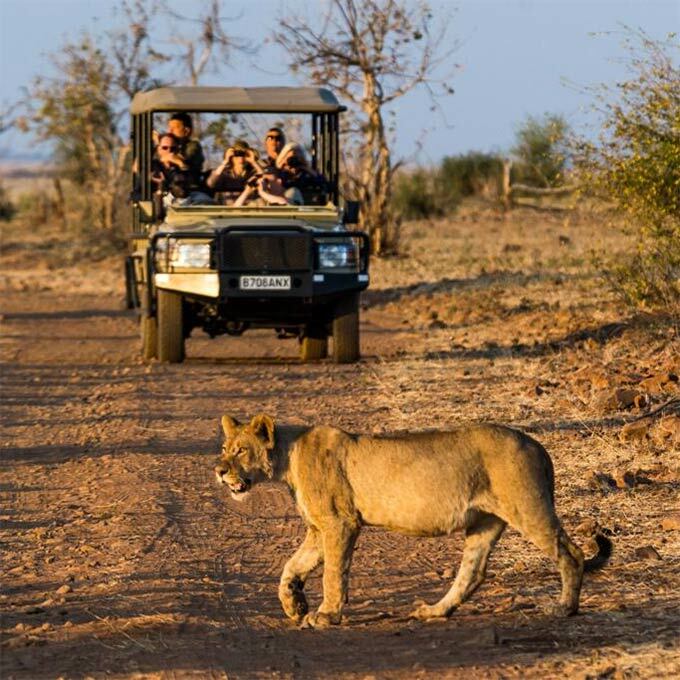 One of the most awe-inspiring safari experiences is the up-close and personal meetings with wildlife at Chobe National Park, and we can assure you will have them frequently during your visit. Welcome to the park with some of the highest game density in all of Africa. You are considering, or maybe even planning, a trip to the Chobe National Park. Naturally, you want it to be the journey of a lifetime and it will be. Why? There are not not many places left in the world with such unspoilt nature splendor, wildlife and truly pampering lodges. Before you are ready to grab your suitcases from the attic, we would like to provide a bit more background information - if only to stir the anticipation of going – and answer the questions you might have in the sections below. Please use our contact form below for more questions you might have. Chobe National Park with its dazzling, deep blue Chobe River, consists of four areas: Ngwenzumba Pans, Linyanti, Savute and the Chobe Riverfront - and you can read all about them here. Waiting for that special offer, one that seems tailor-made for you? Our special deals offer outstanding value for money, so we hope to see you soon in Botswana's Chobe National Park! Airlink operates daily flights between Johannesburg and Kasane, the bustling capital just north of Chobe National Park. Also Livingstone and Victoria Falls are just a stone's throw away. The accommodations were lovely, the food excellent, and the hospitality was second to none. Can never tire of watching from our deck the constant procession of elephants that trek to drink each afternoon. Although not cheap it is worth every penny... You better plan a stay for two or three days since a stopover only would definitely be too short to enjoy this place. 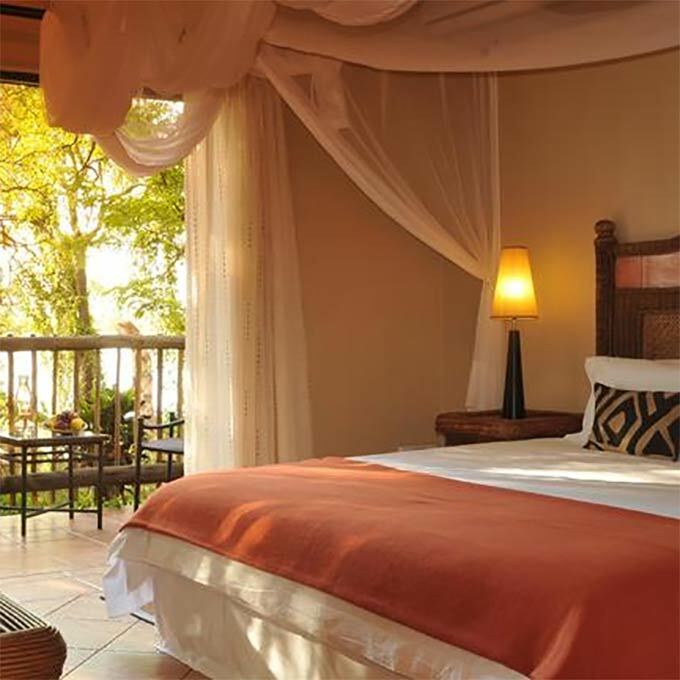 Whereas Chobe National Park feels like true wilderness, once you set foot in one of the lodges you will be embraced with true pampering and homelike vibes. All lodges come with beautiful private suites: the perfect place to start and end an exhilarating day. You only have to pick one of them, or, if you can’t make up your mind, pick several and go lodgehopping. With each and every stay, it will add up to an extraordinary experience. 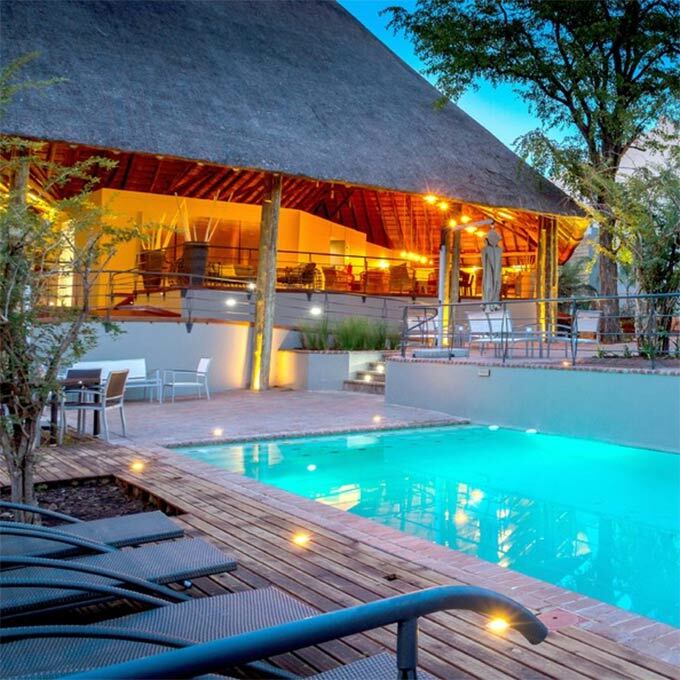 The ‘one and only’ game lodge located right in the Chobe National Park, and what a lodge this is: five star luxury, three safari activities included each day, plus, you will venture out an hour before anybody else arrives in the park. Get ready for fresh game tracks! 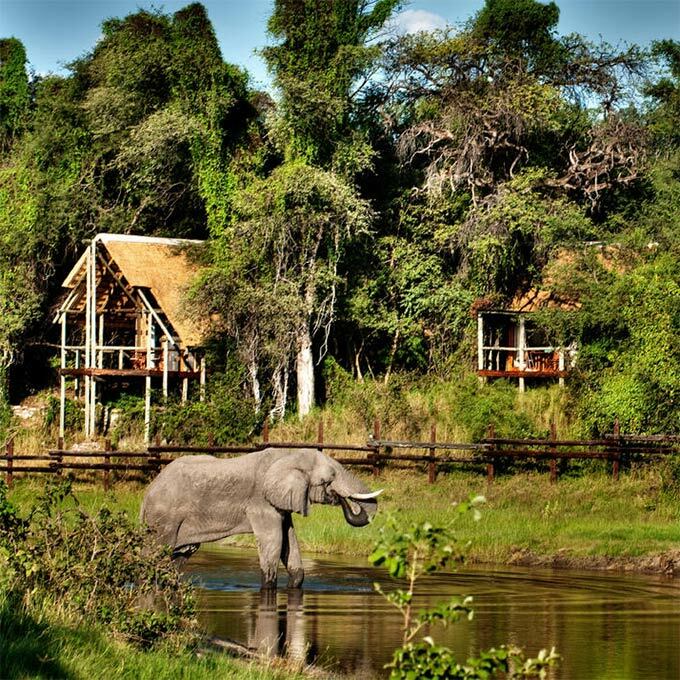 Discover this authentic lodge located on the banks of the Savute channel, where elephants come to guzzle water and play. Fly in with a small aircraft, be welcomed by staff who already know your name and immerse yourself in an African ambiance. Perched high up on the valley’s edge, the views of the river and floodplains are unrivalled in the area. Wherever you are in the lodge, you can watch wildlife gathering by the waterhole. Not to mention all the safari activities Ngoma Safari Lodge has to offer. Always wanted to be eye-to-eye with the magnificent grey giants, that have been roaming this land for ages? At Chobe Elephant Camp, you can get up close and personal with large herds of elephants, among many other predators and wildlife. It’s not a lodge, it’s not a hotel. 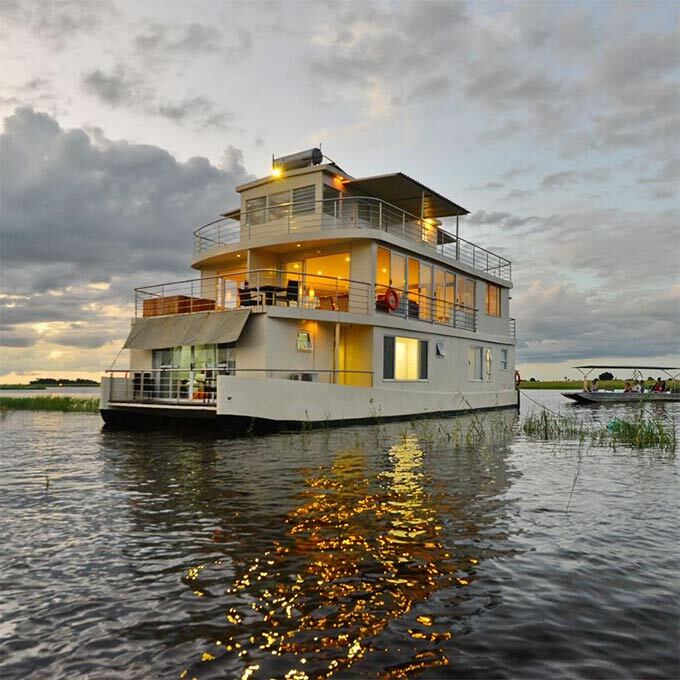 No, the Zambezi Queen is a floating safari boutique hotel, bringing you closer to the Chobe River than ever. 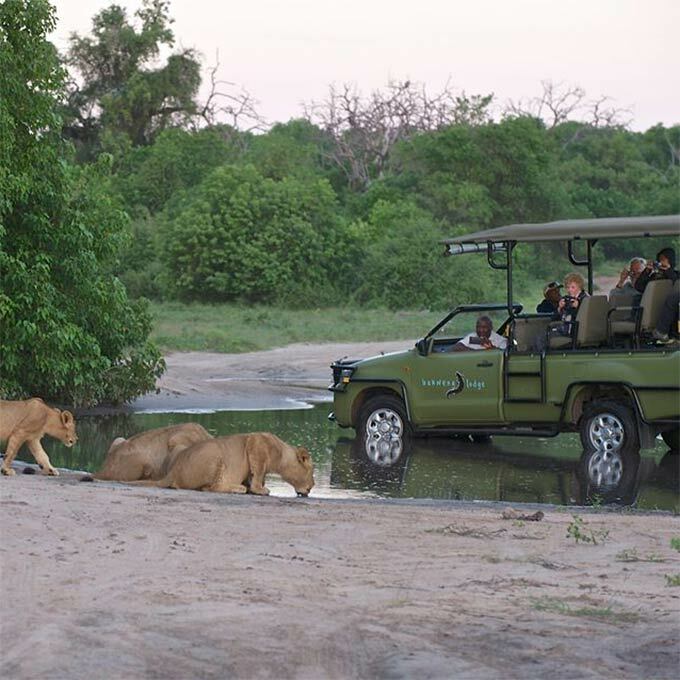 Enjoy the best of an adventurous (yet dust-free) safari, while still surrounded by luxury and comfort. 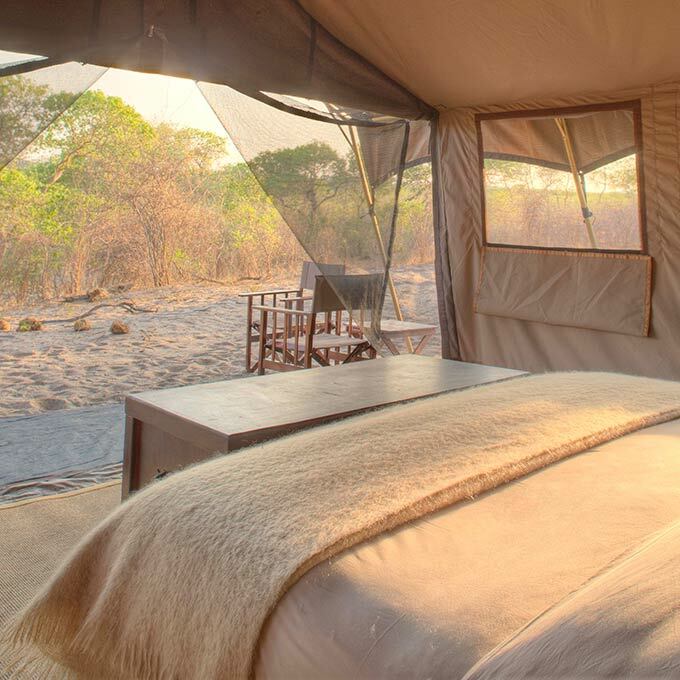 Forget what you know about camping: sleeping under canvas in Chobe will be a completely new experience. Meals cooked over open fire, opening your tent in the morning to an awakening bush – together with the comfort of warm showers and soft beds. Whether you are an angler, golfer, wine afficionado, foodie or simply mad about Africa: this lodge accommodates all safari guests. Its mission statement? 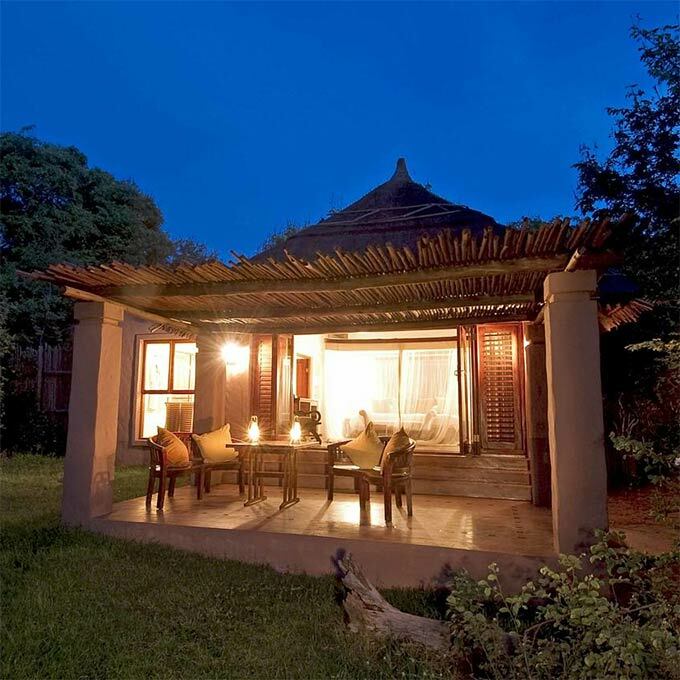 To let everybody experience the natural splendour of Chobe, in the most comfortable and luxurious setting. 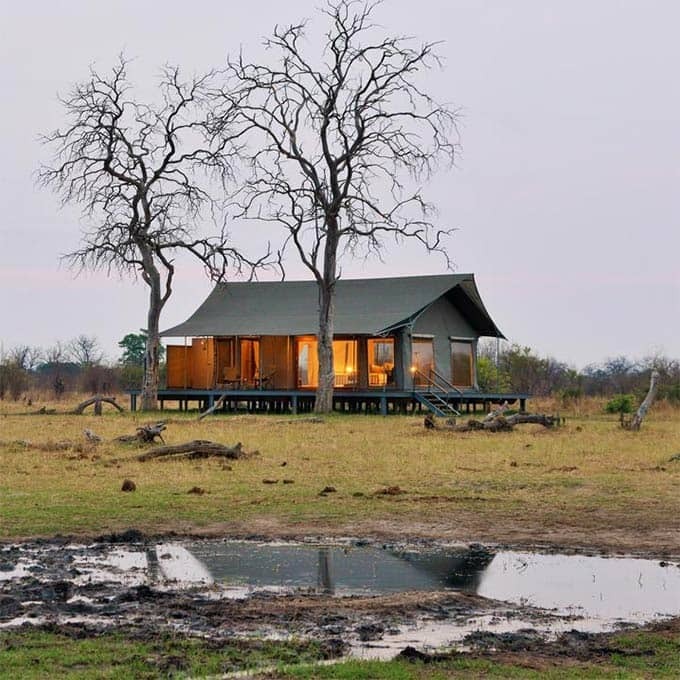 With two owners who both belong to the Bakwena tribe and have a mission to offer guests a luxurious but also environmentally responsible stay, you know this is the right place to experience the pure silence of Chobe National Park in Botswana. Indulge yourself with great game drives, spa treatments, a cocktail bar with the best possible views, river cruise dinners and excursions to Victoria Falls and more. 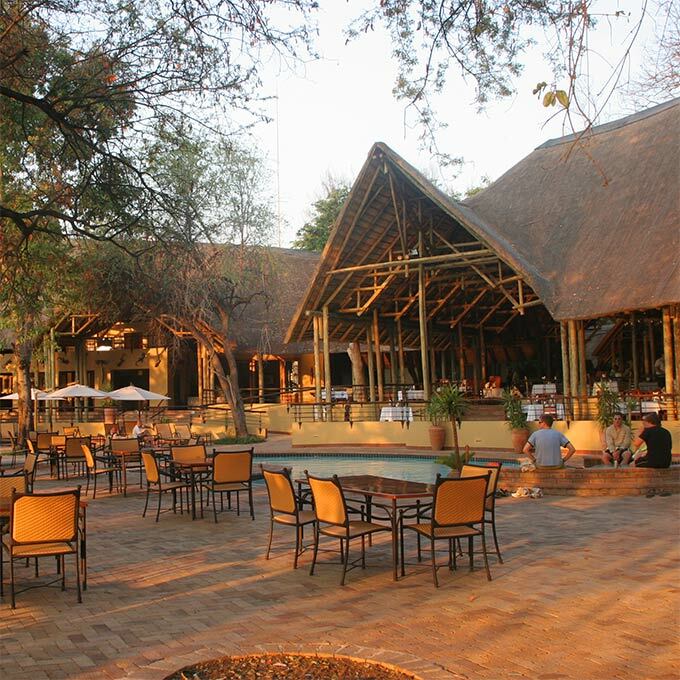 Get ready for an immersive safari experience at Chobe Safari Lodge in Kasane. Looking for a family safari? Or a romantic couple’s getaway? Chobe Chilwero has it all: luxurious private cottages, great children’s programs, spa, romantic hideaways for two – located on the borders of the amazing Chobe National Park, this is where you go for a complete safari experience. Sleeping under canvas can be deeply calming: the sounds of nature trickle right into your ear. And upon opening your canvas to stunning views, you will immediately slip into a relaxed pace of life at &Beyond Savute Under Canvas in this remote corner of Chobe National Park. 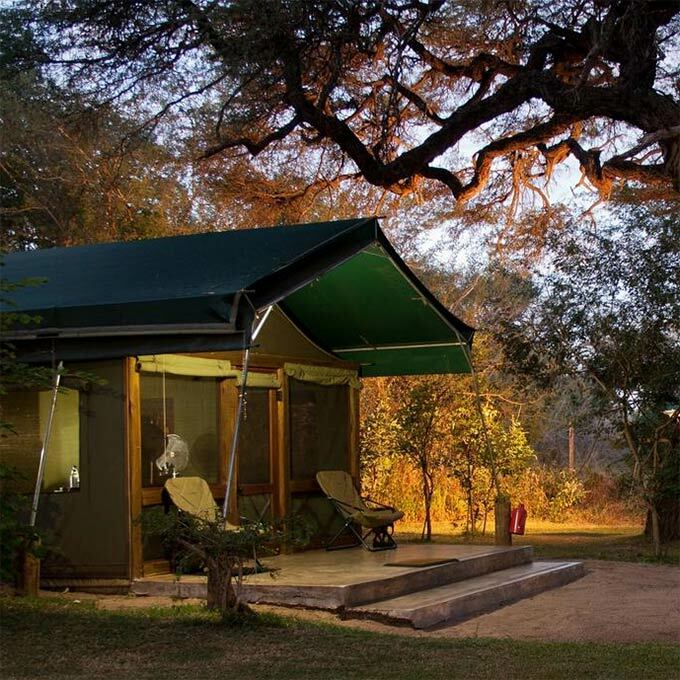 Luxurious camping with incredible wildlife sightings: feel the pulse of the mystic Savute area at this authentic camp. 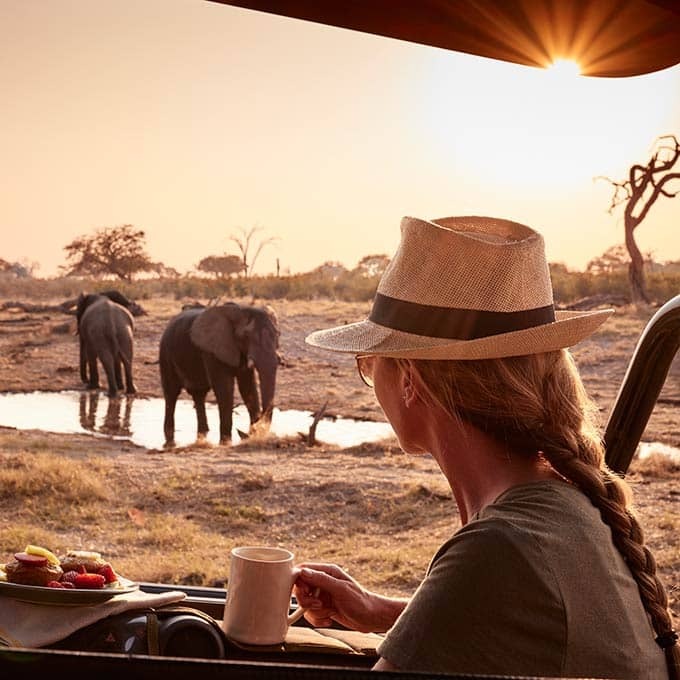 Enjoy dinners around the open-air boma while elephants water in front of you – there are oh-so- many reasons to stay at Belmond Savute Elpehant Camp. 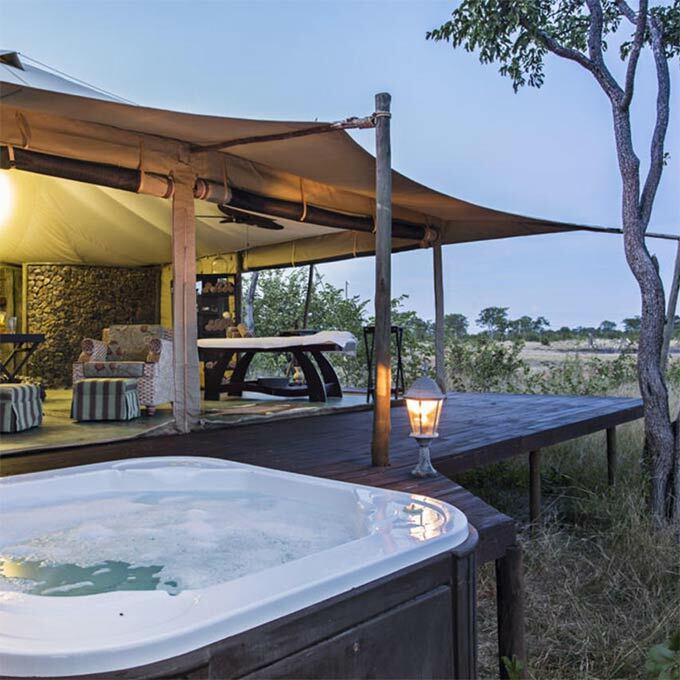 An eco-friendly hilltop retreat boasting 180-degree views at the savannah and a bustling waterhole, located in the game rich Savuti grasslands. Get ready to take everything to a higher level: wildlife encounters, service, dinners, siestas and your overall safari experience. When you kick back in the evening and replenish your wineglass, you peek at the waterhole. Elephants splash about and interact; some are obviously good friends, others, well, not so much. Welcome to the only lodge in the Kasane Forest Reserve with a watering hole near at hand. 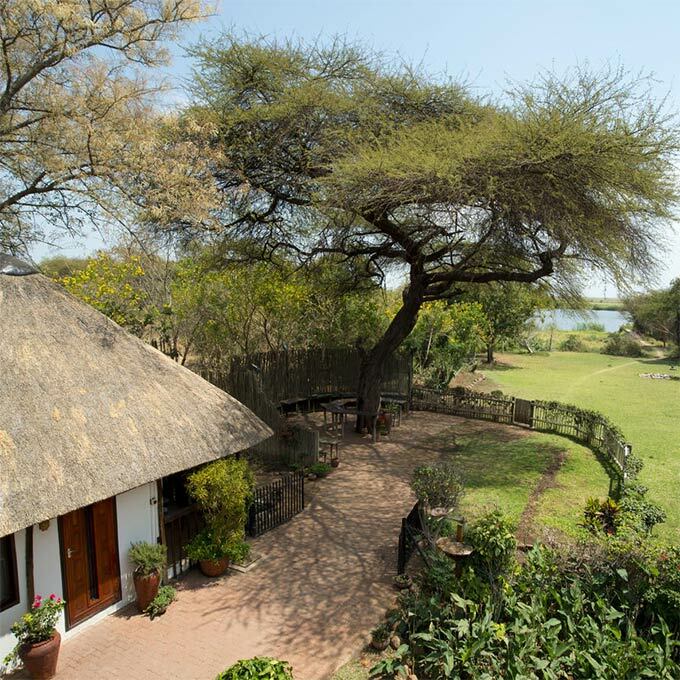 A privately owned lodge, committed to the local community and in the middle of the beautiful Chobe National Park. Encounters with the mythic elephant herds of Chobe, four out of the Big Five and personal hospitality: this is what brings you to the Muchenje Safari Lodge. This new hotel, a sister hotel of the Chobe Safari Lodge, is the excellent gateway for Chobe National Park, Victoria Falls and Caprivi. 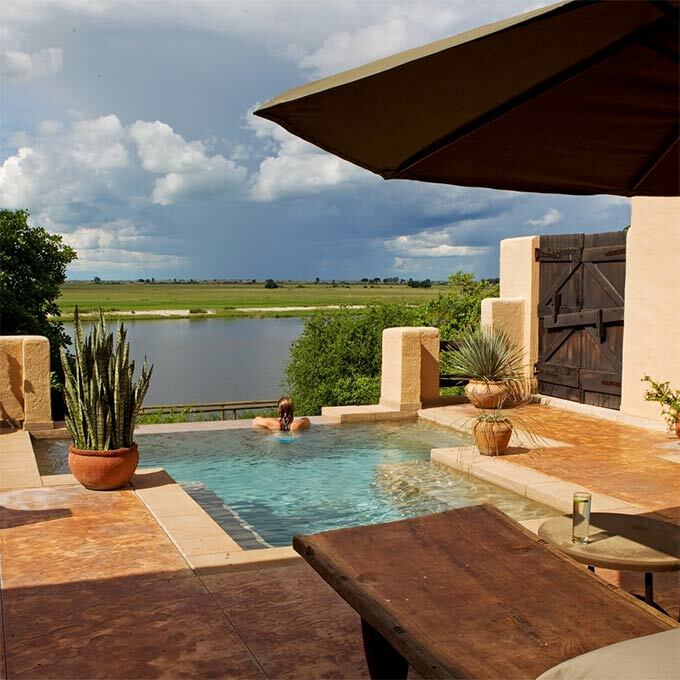 If you are looking for a contemporary safari accommodation with all the luxury frills on hand, don’t look any further. If you want to experience the magic of a Chobe National Park safari, this is the place. Built around a majestic 800-year- old baobab tree and boasting great river views, this is where modern hospitality and century-old landscapes blend seamlessly. 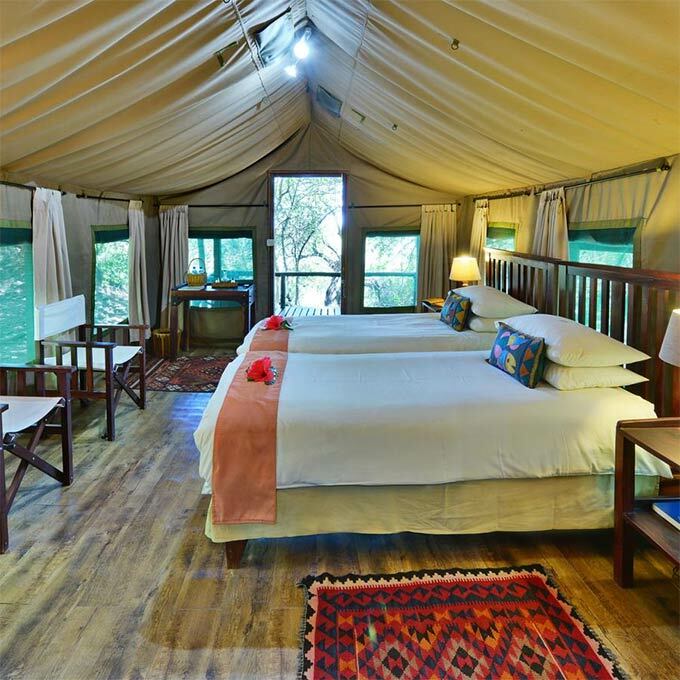 A not-to- beat location, child friendly policy, a wide range of activities (including fishing for the famous Tiger Fish or a boat safari) and sleeping under traditional canvas make this lodge a perfect, family safari location. And it is located on a Namibian island! 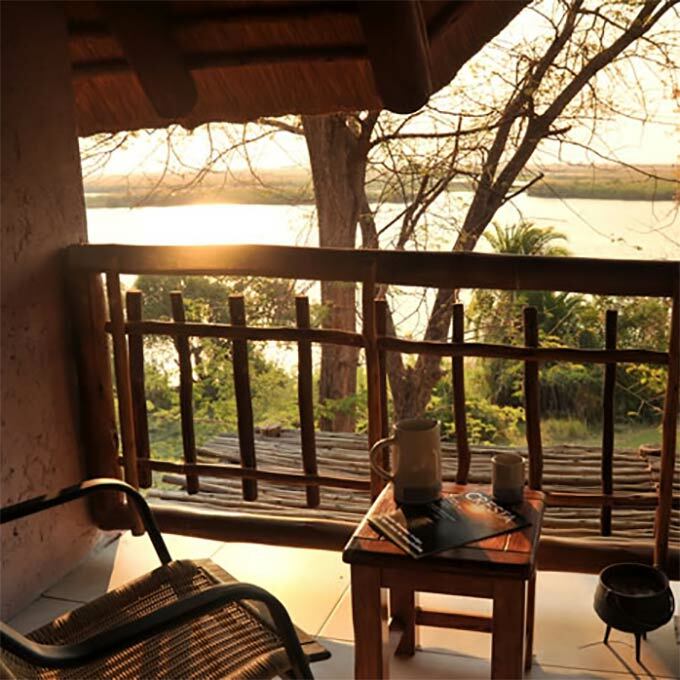 In the small town of Kasane you will find a beautiful Botswana hideout. Secluded by lush green trees lies this intimate guesthouse, where you are up for a personal treat. Whether you feel like relaxing at the pool or seeking an adventurous safari: this is just the place. Are you ready to tune in to wildlife TV? 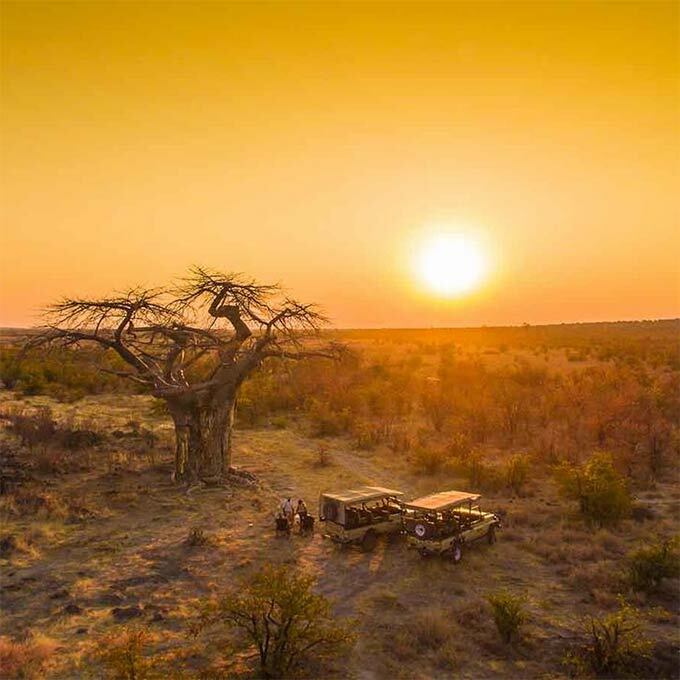 The small, luxurious and intimate Camp Kuzuma is situated by a watering hole, where an amazing variety of wildlife – big and small – passes by every day. Kick back after an exhilarating day to watch yet another wildlife parade. Meet the sisters of the Zambezi Queen: the Pride of Zambezi. Three smaller, more intimate houseboats known as the Chobe Princesses. 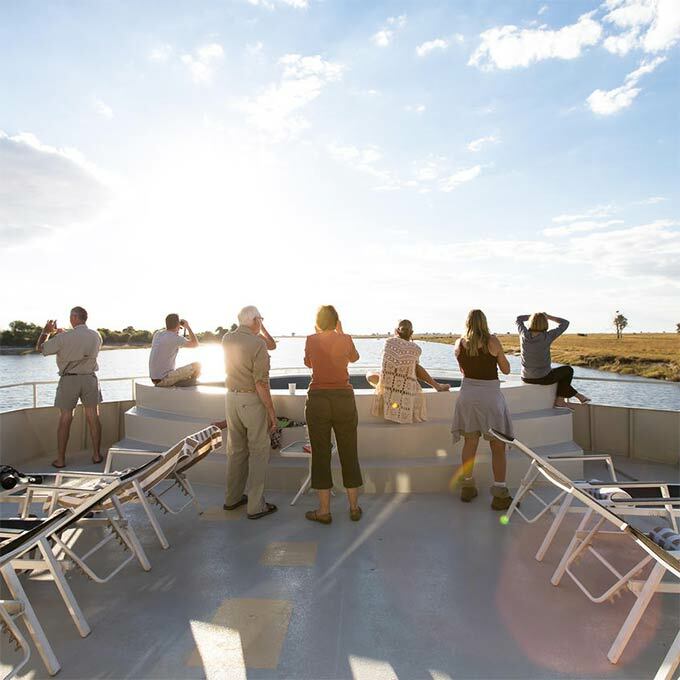 With just four or five cabins, these boutique hotels are the perfect way to find that Botswana flow and cruise the Chobe River in style. A contemporary and open lodge with a real wow-factor: welcome to the brand new Nogatsaa Pans Lodge. This is the only lodge in the Nogatsaa region, so book your stay and don’t miss out on the sweeping views over the Kwikamba Pan. Its remote location will make you feel one with nature. If you are seeking a comfortable, intimate stay in an affordable lodge, River View Lodge is your ideal destination. 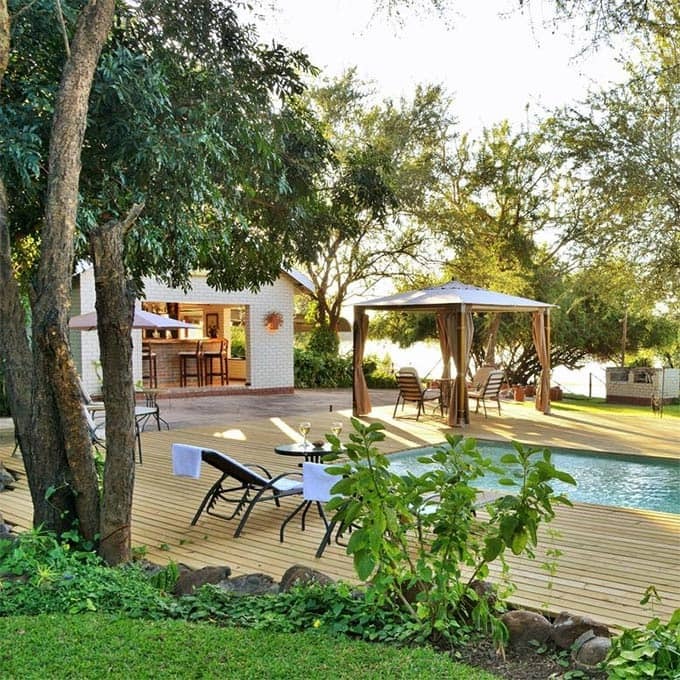 Nestled on the banks of the Chobe River, this lodge is at a perfect, central location to explore the Chobe National Park, Victoria Falls, or to just relax at the poolside for an afternoon. 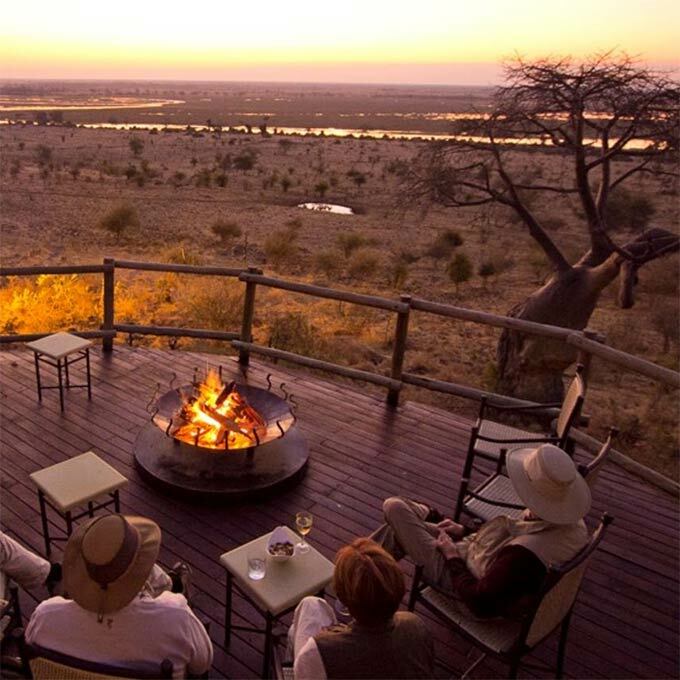 As the staff gather their voices for a local song, you find a cold drink in your hand and a warm welcome to this comfortable safari lodge on the Namibian side of the Chobe River. Water-based, intimate, family friendly and relaxing are just a few ways to characterize this remote lodge. The sunset is an amazing experience as the sun sinks in an array of reds, oranges, pinks and yellows. a sight to behold and one never forgotten. At nights we could hear all sorts of animals and awoke both mornings to find that the noises we were hearing were wondering next to our tents throughout the night. 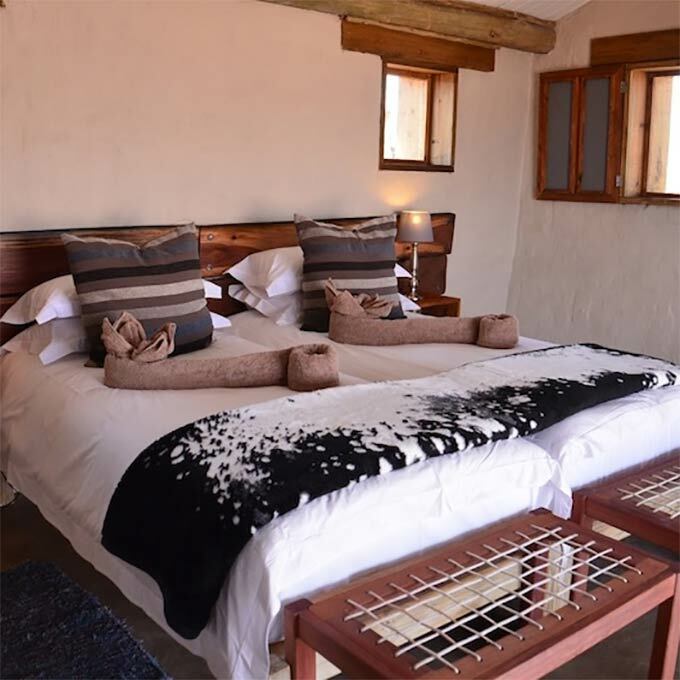 The camp and rooms are beautifully done, and the game drive vehicles are in very good condition and comfortable for long drives. The best way of getting an idea what the Chobe National Park is about is by seeing some incredible footage from the area. View this video of Sanctuary Chobe Chilwero to experience one of the lodges and wildlfe in the game reserve. The small size means you get to eat family style with the other guests, thereby meeting some new people and comparing notes on the day's activities. 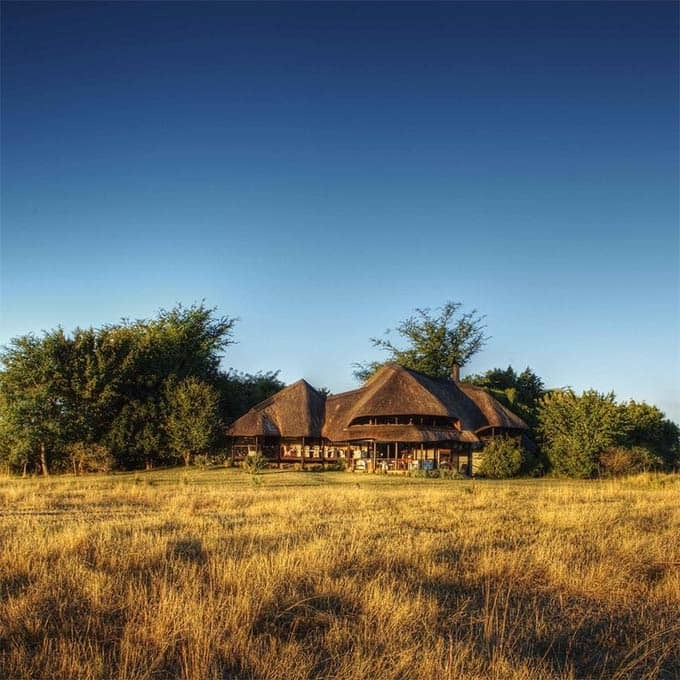 The lodge is set on a hill with a spectacular view over the plains with a waterhole which has a constant stream of wildlife coming for a drink. We saw thousands of elephant, giraffes, lions, kudu,alligrator, water buffalo, springbok, mongoose, and countless other animals, including the fascinating dung beetle. We hope you have found all information needed to decide that the Chobe National Park is the perfect place for your next travel adventure. Still have questions? Or maybe you would like some more specific information about one of the topics on this page? Please fill in the contact form and we will get back to you soon!